Health Minister Jane Philpott is facing accusations that she misled the House of Commons by failing to disclose controversial limousine travel she charged to taxpayers earlier this year. 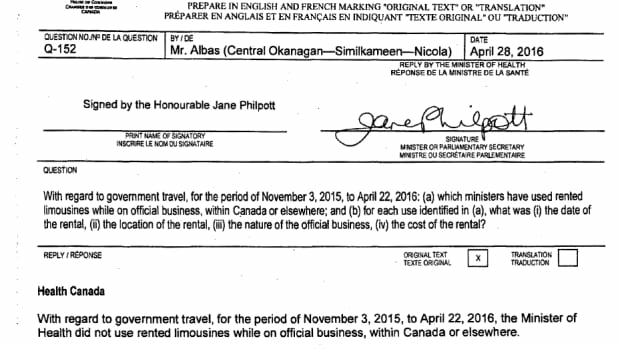 In a response to a question placed on the order paper by Conservative MP Dan Albas about the use of limousines, Philpott's department supplied an answer, signed by the minister, categorically denying any of the luxury vehicles were rented. "With regard to government travel, for the period of Nov. 3, 2015, to April 22, 2016, the minister of health did not use rented limousines while on official business, within Canada or elsewhere," the department wrote in its answer tabled in the House of Commons in June. However, Philpott has found herself in the opposition crosshairs this week after it was revealed that she charged taxpayers $1,700 for transportation around the Greater Toronto Area on March 31, using a limousine service owned by someone who campaigned for her in the federal election. The travel, to four events ranging from Hamilton to Markham and Toronto, took place during the time frame covered by the order paper question. Philpott's office has so far failed to provide any explanation for the discrepancy between her response tabled in the House of Commons and her expense accounts. In an e-mail late to CBC News late Thursday night, her office said "the minister did not, and has not used a limousine." However, spokesman Andrew MacKendrick did not respond to e-mails and phone calls from CBC News to explain what kind of vehicle the limousine service provided. The Canadian Press reported this week that Philpott's office disclosed further expenses paid to the same car service, including $1,994 on July 12, when the minister spoke at an Assembly of First Nations gathering in Niagara Falls, Ont., and $3,814 for 20 trips to Toronto's Pearson Airport before flying to Ottawa for ministerial business. On Thursday night she issued a statement apologizing for the "excessive" cost of the limousine rides she took in March and July, pledging to personally repay the $3,703 tab for those two bills. "I would like to apologize for the excessive costs related to travel for my work responsibilities. This does not live up to the standard that Canadians expect and I have taken steps to ensure this does not occur again," she wrote. "I will personally reimburse in full the expenses incurred on March 31 and July 12 for travel to meetings that took place in the Greater Toronto and Hamilton area, and in Niagara Falls. I have also asked my department to review travel booked to and from the airport with this service to ensure that taxpayers are charged for only fair-market value, and I will reimburse any excessive expenses based on departmental advice." Tracey Ramsey, NDP MP for the southwestern Ontario riding of Essex, said that kind of spending angers residents of her riding. "Folks in my riding can't afford gas to go and get their cancer treatments in Windsor, which is not far away." Conservative Colin Carrie has written to ethics commissioner Mary Dawson asking for a formal investigation of Philpott's use of a service run by one of her political supporters. He said he also wants to know if other ministers are doing it too. "I think the PM needs to man up and show leadership," he said in an interview with CBC. "He should be demanding a review of all minister expenses to see if this is a trend, if this is a pattern." 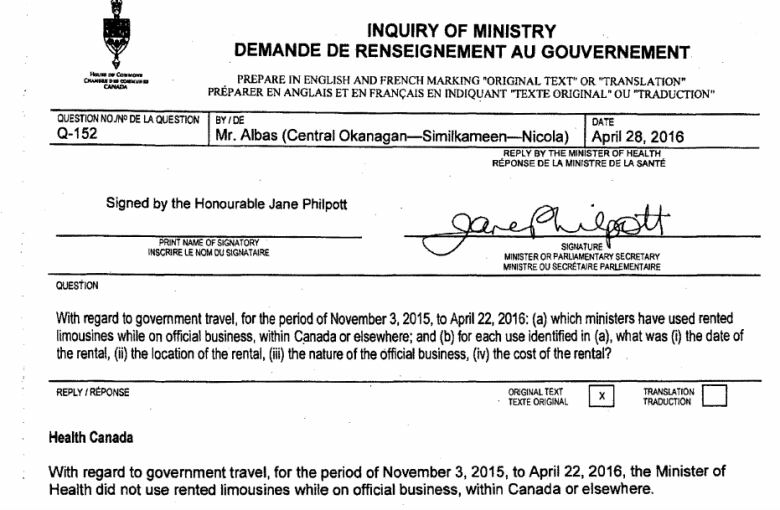 In the same document, three of Philpott's colleagues disclosed spending on limousine rentals. 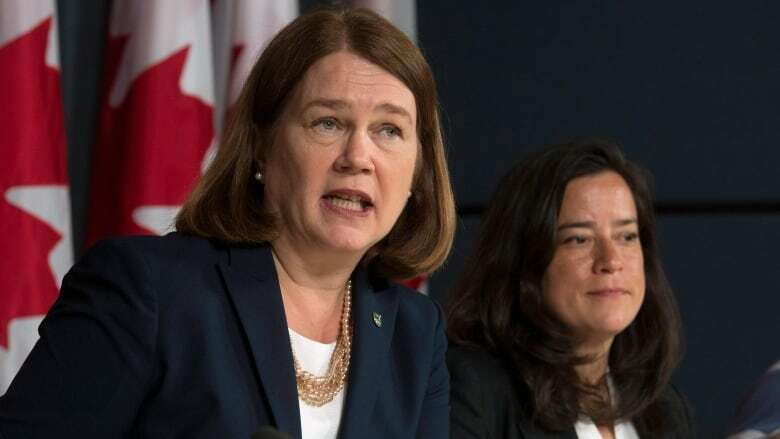 Justice Minister Jody Wilson-Raybould disclosed two limo trips from the Ottawa airport totalling $222, while in February Democratic Reform Minister Maryam Monsef took a $145 limo ride home from the airport in Toronto. Defence Minister Harjit Sajjan spent $1,515 on a limousine in San Jose, Calif., in April where he delivered a keynote speech at a conference on cyber security and visited area industry. Ramsey described Philpott's answer tabled in the House as "dishonesty." "This is serious. When you are asked something through the House of Commons, you have a responsibility to be honest and you really should be representing whatever type of spending you have." Carrie called for Philpott to explain the discrepancy. "Obviously, if she's stated one thing and the reality is something different … this is something that's going to be a real problem for her, and it's up to her to explain that." Misleading Parliament by knowingly presenting false information can be a serious charge in Westminster-style democracies like Canada's and can lead to a minister's resignation. Meanwhile, Conservatives moved quickly to make the most of the controversy, dubbing Trudeau's government "Limousine Liberals." Wednesday evening, Conservative Party leadership candidate Kellie Leitch tried to leverage the controversy into support for her campaign, sending out an email calling for donations and volunteers. "Whether it is limos, fancy junkets, lavish spending or a ballooning lobbyist registry, the limousine Liberals can't control their spending habit," she wrote. "We could be spending these precious dollars on desperately needed youth employment programs or health care for our veterans. But instead … a Liberal minister and her thousand-dollar limousine rides."